The site is a crescent-shaped development with 62 dwellings and a projecting lower ground floor with commercial space and a café. The development is one of a planned programme of 17 major regeneration initiatives in the town. The Alpro transom closers are being installed on doors manufactured by Poole-based Abbey Southern. The closers are a means of hydraulically controlling the opening and closing of aluminium doors. Builders and glaziers benefit from the ability to adjust the latching and closing force created by the hydraulic valve according to the weight and height of individual doors as well as type of usage. Precise adjustment of closing force is vital at a site such as Leyton Mount which has a varied user base. Transom closers are contained within the transom header bar of a door. They are therefore well suited to use at premium developments such as Leyton Mount where the design by architect Terence O’Rourke must not be compromised. Aesthetic concerns are also apparent in the specification of Alpro Impressionist 304-grade stainless steel pull door handles which have been used extensively across the complex. Civils have been performed by residential construction and social housing specialists Lovell who excel in sustainable working methods. 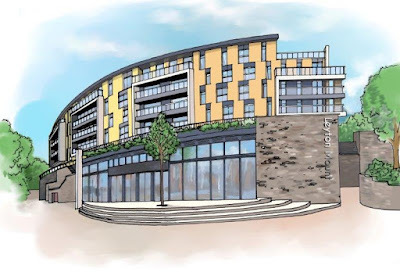 The building will accelerate regeneration of the Horseshoe Common area of Bournemouth. Funding includes a £5m grant from the Homes and Communities Agency’s ‘Get Britain Building’ loan and equity fund to housebuilders. Abbey Southern fabricates aluminium and uPVC doors, windows and curtain walling. The company serves end-users predominantly from the educational and housing association sectors. Abbey Southern supports a client base of approximately 150 independent window companies and installers. Founded by Abbas Mazrae, it operates throughout southern England and into the Midlands.